You can also use our [http://www.digital-digest.com/articles/searchwizard.php search wizard] to narrow down the search results. 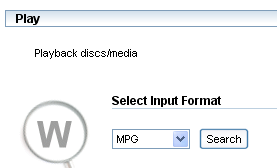 You will be presented with several different options based on things you are likely to use the article/guide for (for example, "Create" a new [[DVD]], "Play" a [[DivX]] file, "Backup" a disc ...). Choosing one of these options will present you with more options, specific to choices you have made so far (for example, choosing "Play" will ask you specify which format you want to play). 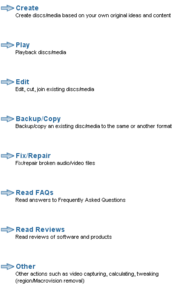 This help guide shows you the many different ways you can search for articles and guides on Digital Digest. All of the below options can be accessed from the Articles section's main page. At the top of every page is a search engine, which allows you to search for articles, software and news items on Digital Digest. To search for the article you need, simply type in the title of the article or a description of it in the search box and press the "Search" button. You can also use our search wizard to narrow down the search results. You will be presented with several different options based on things you are likely to use the article/guide for (for example, "Create" a new DVD, "Play" a DivX file, "Backup" a disc ...). Once you have selected all the options, the search result will be returned just like a standard search. The final method for software searching is the category search. Each software will belong to one or more "Main" category (such as "Play", "DV" or "Mac OS"), and one or more detailed/sub categories (these are more detailed categories, such as "Audio Editors" or "Subtitle Playback"). You can see a list of the main categories here. You can see a list of the detailed/sub categories here.